We are back from our post deployment family vacation and we absolutely loved Branson! It was our first time to visit and we had an amazing trip. Branson is a great destination for families and there is simply so much to do. We'll be sharing the highlights of our trip this week and hopefully helping you to plan your own family trip. First up? The Amazing Pet Show at the Grand Country Resort. 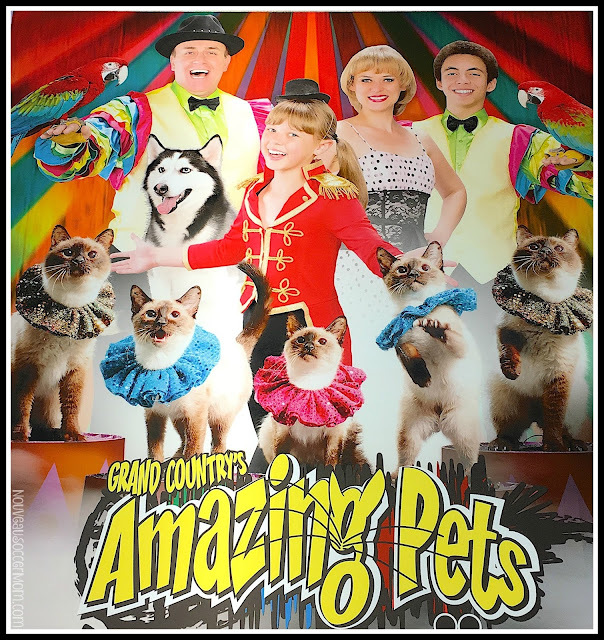 The Amazing Pet Show is one of the shows at Grand Country and offered the choice between Saturday or Sunday shows on our vacation dates. Depending on the time of year one visits, show schedules vary. Since we arrived on a Saturday, we opted for the Sunday morning show, just a short walk from our room. The show begins with host interacting with the children in the audience, telling jokes, etc, as a warm-up, and then the pets join in! From huskies unfurling the show's flag to poodles balancing on barrels and riding a bicycle, the animals love to entertain. There's also dogs dancing in costumes from varying countries, trained parrots flying overhead, and house cats rolling barrels, doing jumps, and even crossing bridges. 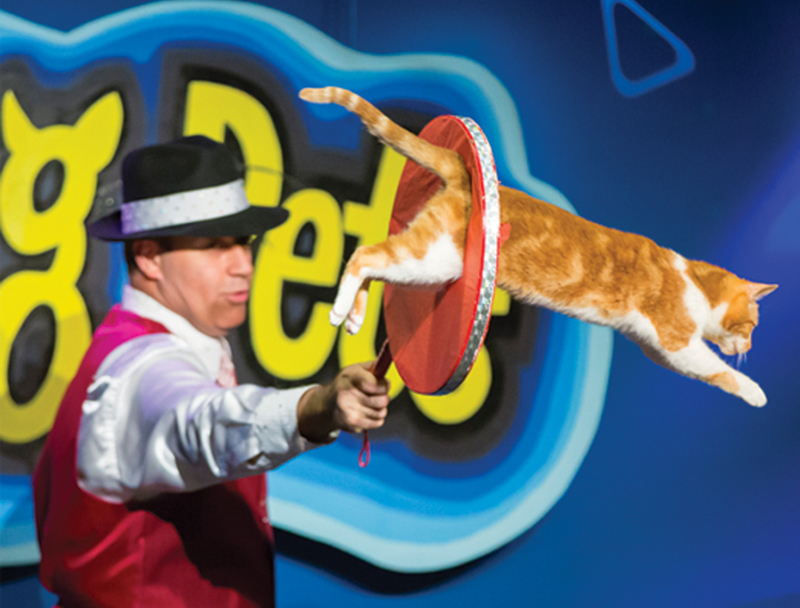 We were especially amazed that anyone could train cats to cooperate! 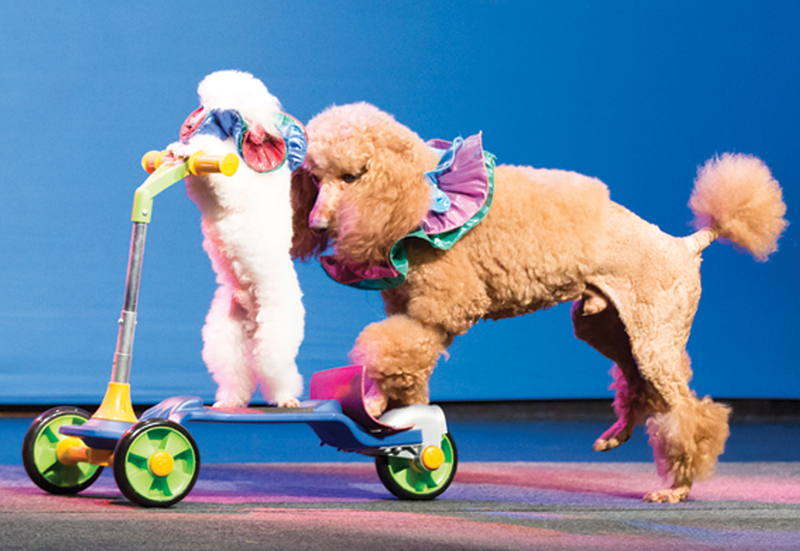 With the mix of audience interaction and the pets, it's a great show for even the youngest members of the family. We had several families with little ones sitting near us and the children were riveted by the animal antics. The Amazing Pet Show lasts approximately an hour and a half, with a 15 minute intermission where one can purchase snacks, gifts, or a photo with one of the amazing pets. For more information, visit the Grand Country website. As well, my readers can save $3 off each Amazing Pet Show tickets with this coupon, mention when booking. Disclosure: This post was written as part of my relationship with USFamilyGuide. My family was provided with tickets for the Amazing Pet Show during our Branson vacation for the purposes of this post. Show action photos provided by Grand Country.